Our managing editor Sam Martin contends that his mom (or “mum,” as our Aussie employee calls her) has the best brownie recipe in the universe, so we put it to the test to see how it fares as the best cannabis-infused brownie. We love it because it incorporates raspberries, which give it a juicy fruit flavor and pops of rose-red color. It’s also unique in that it should be served chilled, and in that original temperatures and measurements are in metric and Celcius. How worldly! Yield: One 9” x 9” pan. Preheat oven to 180°C (about 350˚F). Lightly grease a 24cm (9” x 9”) square cake tin. Line with baking paper, extending the paper beyond the rim of the tin. (This makes it easier to get the brownies out later.) Heat the cannabutter in a saucepan over low heat. When half-melted, add the chocolate and stir with a wooden spoon until the butter and chocolate are completely melted and combined. Remove from heat and stir in sugar. Beat in eggs, one at a time, beating until mixture is shiny. Stir in vanilla. Sift in the dry ingredients and mix thoroughly. Pour into prepared tin and top with raspberries (if using). 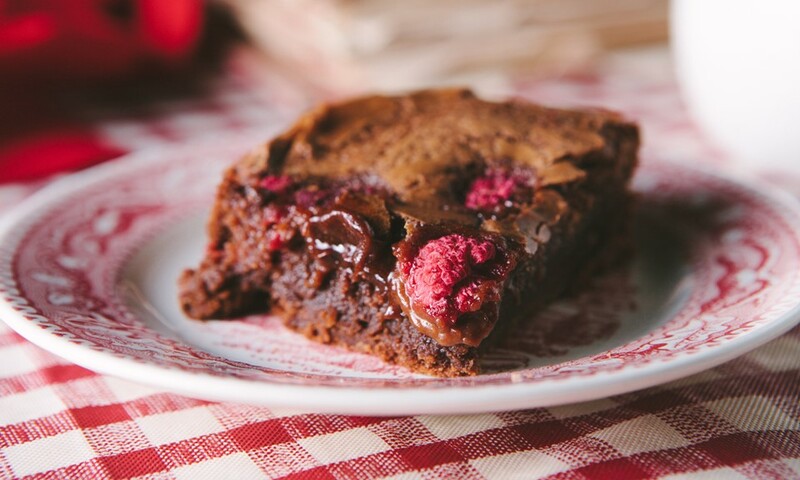 Bake for 35 minutes if not using raspberries, or 40 minutes if using raspberries. Do not overcook. Cool completely in the tin. Refrigerate and once cold, remove from tin and cut into rectangles. Serve chilled! Whose brownie recipe makes a better pot brownie, Sam’s mom’s or Martha Stewart’s? Watch the video showdown to find out! Note: The amount of cannabis butter specified in this recipe is a very loose suggestion; the actual amount you use should be modified based on the strength of your cannabutter and the potency you desire. Dosing homemade edibles can be tricky (click here to learn why), so the best way to test for potency is to start with one portion of a serving, wait one to two hours, then make an informed decision on whether to consume more. Always dose carefully and listen to your body, and never drive under the influence of cannabis.